"Lasto beth nín. Tolo dan nan galad." 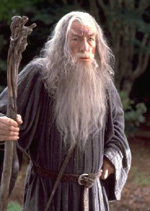 Ian McKellen plays Gandalf the Wizard, one of the nine members of the Fellowship of the Ring. Ian Murray McKellen was born on May 25, 1939 in Burnley, England.